Quickly sketch your idea. This is technically your the very first prototype. It will help your group agree on the basics of what the idea is. 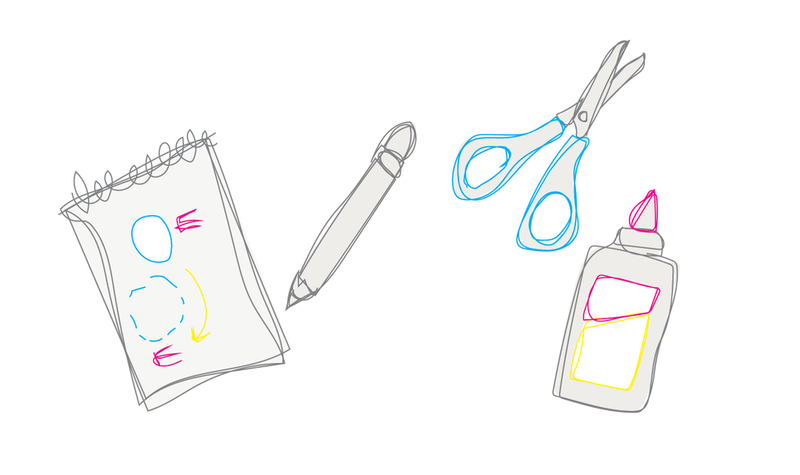 Get something on paper that you can then use as a blueprint to build out a more detailed prototype. 3) Identify what you want to learn. What do you most want to learn about your idea? Have each person write down a few questions they want answered on sticky notes and cluster everyone's responses. Discuss and agree on the 2-3 things you most want to learn and who you want to test it with—this will help you focus your prototype, but it doesn't mean you can't learn about other things as well. 4) Decide how you want to prototype your idea. For a service interaction, try a role play or skit. You could use a storyboard (left) or flowchart (right) to prototype an interaction or service. Get ready to get messy and make things! Use any materials you have to hand, and work quickly with what you already have to make a prototype of your idea. Protip: The purpose of a prototype is to demonstrate and test properties of your idea. If there are several important things you want to learn, you might want to build separate prototypes. It can be helpful to split into smaller groups, with each working on a different prototype. a. What did you build? What materials did you use? b. Which aspect(s) of your prototype are you most pleased with? Which do you feel still need work? c. What did building help you learn about the problem you’re working on? d. What advice would you give to someone who has never built a prototype before? What did you like about the Build Prototypes workshop? How would you improve the Build Prototypes workshop? What questions do you have about the Build Prototypes workshop? Did the Build Prototypes workshop give you any new ideas you'd like to share? Up next, you'll use your prototypes to gather feedback from the people who will be using.